A couple of weeks earlier, my friend Sarah Toth gave my name to Jen from the Tottenham Public School as someone who might be interested in speaking at their Career Day for the kids. What a fun opportunity! So of course I said 'YES' when Jen called to see if I was interested! I mean really....look how long it too me to figure out what I wanted to be when I grew up. It wasn't until a few short years ago when I was in my late 30's. It wasn't like I didn't like the jobs I had during my career so far, but I knew it just wasn't 'the' thing I wanted to be doing. When my little Ben told me a couple of months ago (when I asked him what he wanted to be when he grew up....I like to check in with him on that every once in a while), "I don't know Mommy, there are so many things to choose from", I don't think he really knew how right he was. The kids were great. When I arrived, four of them greated me and gave me my schedule, map, water bottle and name tag. They were very organized and very polite. I had four sessions to do. They were 30 minutes each, and trust me, 30 minutes to talk and answer questions really isn't that much time. Especially when the path I took to get to where I am now wasn't necessarily straight path. When you take a look back at the things you've done and accomplished, sometimes it's surprising and you wonder how the heck that all happened. Some students had questions, some didn't. Some had an idea what they wanted to do career wise, and other had no idea. Pretty much standard. :) There was one girl, Kelly, who seems to have an interest in Photography and we chatted for a while. It will be nice to hear about her journey in discovering if Photography really is something she wants to pursue long term. Hopefully the students got something out of my time with them. Even if something I shared about my experiences made only one or two of them think about something they hadn't considered contemplating before, that's pretty cool. As I mentioned in at least one of the sessions, you don't know what you don't know, so keeping an open mind and being in a continual learning mode will help you be successful at whatever you do. Thanks for looking and thank you to the Tottenham Public School for inviting me to be a part of their Career Day. In addition to the usual every day 'stuff', I had a photo session with the adorable Alexander. We were supposed to schedule his 9 month session in mid-late December, but everyone was so busy with the holidays that it just didn't happen. So we did a 10 month instead :) So much fun! Helping Hearts is a project created by Melissa Knowles & Michelle Regner from B.C. with the goal of being able to provide free photography sessions for families with sick children. If you are a family looking to book a session with a photographer in your area please email info@helping-hearts.ca. There is also more information on the web site under the 'For Families' section. If you are a photographer looking to join the Helping Hearts team please email photographers@helping-hearts.ca. You can also find more information on the web site under the 'For Photographers' section. You can see the new logo on my blog over on the right side. 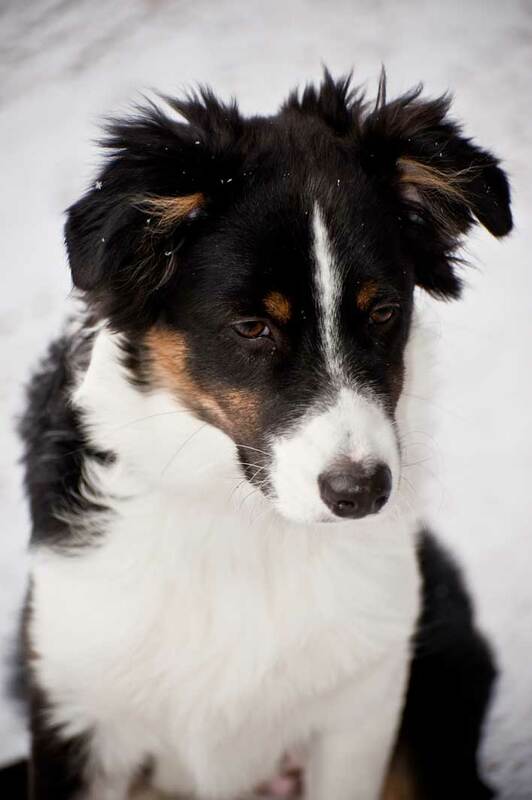 If you read my post here, you'll know we are trying to win a donation of up to $10,000 for the Aussie Rescue organization we adopted Maggie from last November. I'm pretty sure we need to aim for over 1000 votes to make it through to the finals. Each and every vote each day is so important. "If I smile, will you vote for me?" Here is the new link for Round 3. Just over a week ago I went to a networking Mix & Mingle over in Orangeville. Sara and Rachel started Dufferin Mompreneurs to help local Mompreneurs by providing affordable opportunities for local moms in business. They plan events for mompreneurs to sell and showcase their products to the local community. On January 15th, they held their first Mix & Mingle. I took a few photos as I knew I'd want to do a blog post about it. It was nice meeting all of the ladies and hearing a bit about their businesses. It was a nice cross section of businesses: Photography, Baking, Jewellery, Fitness, Handmade textiles & other cute things, Cosmetics, Interior Design, Housewares and I know I missed a few. PHOTO OF THE WEEK #29: What do you see.....? What do you see with those big, beautiful eyes? She is a wee bit older than the previous baby girl I photographed. She was born in late December. She too was a wide awake baby girl, despite the feeding, swaddling, direct heat from the little heater......she did not want to miss any of the action. Her big brother Daniel got in on some of the photo action. He had just woken up from his nap and wasn't too keen on being in front of the camera. "You want me to wear this?!" He was so cute in his little suit. But he wasn't very interested in having the tie on. He much rather enjoyed just playing with it. And one last sneak peak of baby Athena. So adorable and cute and almost asleep....finally. I hope you enjoyed your sneak peak. Hello to my blog readers in Canada and the United States. I'm writing today to ask for your time to help support a pet cause. Bissell is having a photo contest. The prizes include a donation to the pet charity of your choice. Our pet charity is the Aussie Rescue Placement Helpline, which is where we adopted Maggie from last November. The winner will win a donation of $10,000 to their charity. Second place wins $5000 to their charity and third place $1000. A charity can do a lot with that much money. You remember Maggie, right? In case you've forgotten, click here. This contest is LONG! There are 12 rounds, however, if you make it through in one of the rounds, you don't have to enter in subsequent ones. The top 5 from each round go through to the finals. I know these things can be tedious at times. Registering can be a pain in the arse. But once you're registered, you only have to enter your e-mail address to vote each day. Unfortunately, you can only vote if you're from Canada or the United States. They validate that by the e-mail address you sign up with. Over the past several months I've registered with Pepsi and Aviva contests to support both animal and people causes of friends and followers like you. I haven't received e-mail SPAM from any of those to date. So please, if you can spare a minute each day, head on over to Bissell's contest and vote for Maggie. We need probably around 175 votes or so a day to make it through. That's a lot of votes! Please share with your friends and family. The link is below her photo. I had been hoping to have my January Newsletter out by now, but it seems that hasn't happened yet. So in the meantime, I thought I should post this before January was over! 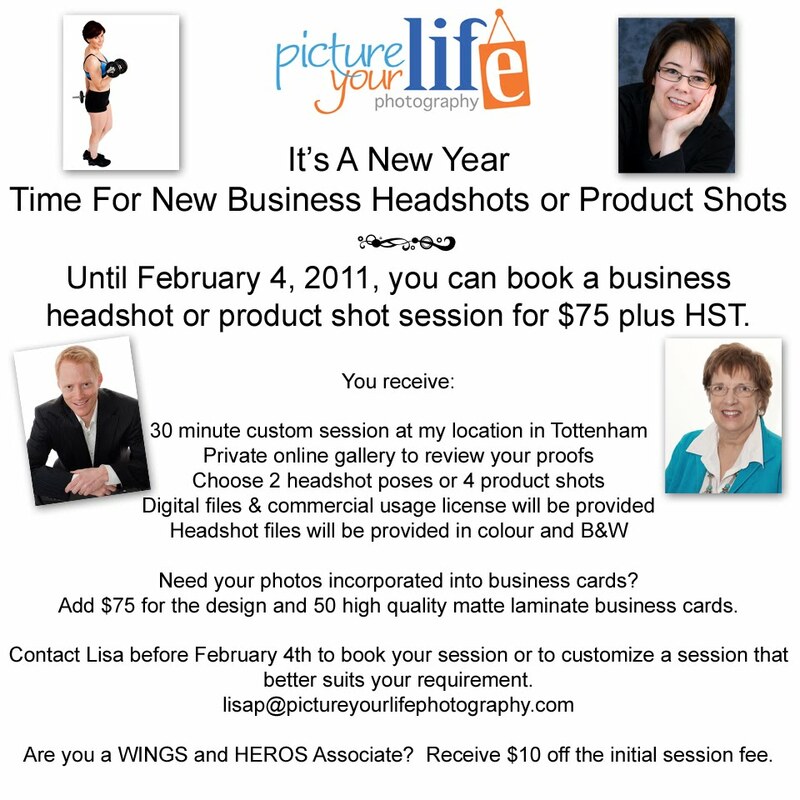 You'll save at least $20 as the digital images are not usually included with the session fees. I was very excited to receive a call from someone who received a gift certificate for a session at their baby shower, from an existing client of mine. Their little bundle was born on New Year's day. How exciting! It's amazing how strong her little arms and legs were already. I would try and put her in her little poses and she would have nothing to do with it! :) She was awake almost the entire time and there was hardly a peep out of her. Such a precious little thing. Congratulations to Mom and Dad and thank you for having me in your home to photograph your new family. PHOTO OF THE WEEK #27: Happy New Year!! 2011 already! 2010 seems like such a blur. Time has always gone by quickly, but I think even more so since having a child growing up in the house. Some of my work plans during that time included reviewing my costs (as every busines owner should do periodically) and re-align my pricing accordingly. I also wanted to organize and announce new product offerings. And probably the toughest thing (for me) was that I wanted to get my home office all organized and start the year off 'fresh'. How did I do? I did a wee bit of work on the first two and as far as the organization goes..... well that didn't happen. I decided that it was good to take a bit of time with the family and enjoy a few days with them. I could do without the few extra pounds I packed on though (and my Wii Fit Plus disc seems to be having issues too!). I hope to get my first Newsletter for 2011 out this week, as well as post my new pricing and product offering information. Ben was very excited about Christmas this year. But equally excited, in her own way, was Maggie. This was her first Christmas. I'm sure she has no idea what the fuss was about, but she definitely knew there was a fuss. Ben picked out her Christmas present himself and she loves it. Each section of that snake has a squeaker in it. She even got poop bags in her stocking from Santa. Maggie scored pretty big with treats and toys from family and friends. I think she was one happy puppy.